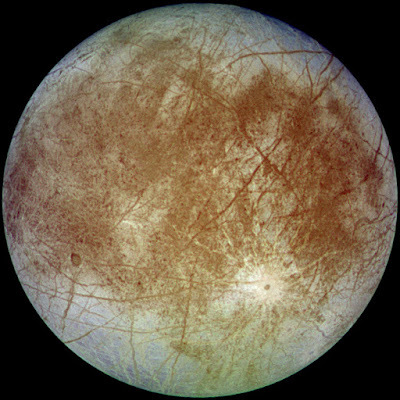 NASA published a somewhat cryptic message, Tuesday, stating that there is “surprising activity” on Europa – the most well known of Jupiter’s 67 moons and it will be holding a teleconference at 14:00 EDT, 19:00 BST Monday, Sept. 26, to present new findings from images captured by the agency’s Hubble Space Telescope of the icy moon. NASA has been analysing data from its Hubble Space Telescope which is currently prowling the universe and astronomers will present results from a unique Europa observing campaign that resulted in surprising evidence of activity there and it was widely reported that the existence of extra-terrestrial life would be revealed next Monday. However after a meeting Wednesday morning between the NASA Director Charles Bolden [MajGen USMC Ret.] and Brigadier General "Whopper" Creedon of SPEARHEAD, NASA were quick to tweet: "Monday, we'll announce new findings from Jupiter's moon Europa. Spoiler alert: NOT aliens." So it appears SPEARHEAD has silenced NASA's true reasoning for the teleconference and will reduce them instead to discussing subsurface ocean microbes. Europa's ocean is believed to be salty, and warmed by powerful tidal forces generated by Jupiter's gravity so that it remains unfrozen. Most scientists agree that where there is water, it massively increases the chances of finding life.